Is a “Burmese Spring” Happening? “What about Burma?” Since the beginning of the Arab Spring I have found myself thinking this often. Burma has been torn apart by civil war for over 60 years in what is currently the longest running war in the world. Even today, in a time where Burma seems to be heading more and more towards true democracy, the minority tribes of the Burmese highlands continue to be oppressed in what could be considered ethnic cleansing. Despite ceasefire negotiations violence still continues, especially in the Kachin State where over 40,000 people have been displaced by the fighting since June. Secretary of State Hilary Clinton’s recent diplomatic visit to the country highlights the thawing relations between Burma and the West, but is it too soon? Following the fraudulent elections of 2010 Burma surprisingly has taken moves to end human rights abuses against the Burman majority in the country going as far as to release the long-imprisoned opposition leader and Noble Laureate Aung Sang Suu Kyi. Couple this with ceasefire negotiations with the Kachin Independence Army and other ethnic resistance groups and it would appear that peace will finally be attainable. But, as the old cliché goes, appearances can be deceiving. Despite an unofficial ceasefire ordered by both sides the government continues sending more and more reinforcements and supplies into the Karen State. In the Kachin State, where negotiations are being held, attacks continue daily including bombardments of cities housing refugees and civilians. After over a half century of war people are tired of fighting and dying but the government continues to antagonize. But there is hope. The ceasefire in the Karen state is unofficial but appears to be holding. 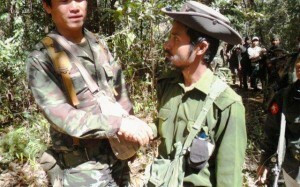 Local commanders seem to be using their own authority to end the fighting and there have even been moments of friendship such as the one in the picture in which a unit of the Burmese Army ran into a Karen National Liberation Army patrol. Both sides agreed not to shoot and they exchanged jokes and handshakes. After a few lighthearted moments in this seemingly perpetual war zone both groups exchanged farewells and left without firing a shot. Do these actions suggest that the soldiers who have been fighting these battles are growing tired of war? Has the message of peace the government proclaims but does not practice inadvertently reached these soldiers in the war zone? Is it possible that the people of Burma are turning away from ethnic war and embracing freedom and democracy for all? Will there be a Burmese Spring? Is it happening already? Time will tell but until that day the international community needs to wake up and take notice of the innocents being murdered daily. We need to support the peace process and if the government refuses to stop the fighting we must support those men like the soldiers in the picture who are doing it themselves. We need to let the tribes know that the world knows what is happening and stands by them. And most importantly we need to continue sanctions until we are sure there really is peace. Burma seems to be opening a new chapter in its history but if the UN, US, and EU lift sanctions and legitimize the regime too early that new chapter might well just be a new war. And while Libya showed us that was one solution, Tunisia showed us it did not have to be. Peace is always preferable and it seems that peace can be attained if things continue as they are. I think that the world must continue opposing the government of Burma until the day comes when we know their intentions are true and that peace has come. If you would like to become involved you can donate to the Free Burma Rangers, a group dedicated humanitarian support that works with the rebels. You can also make tax deductible donations to Burma Lifeline, a nonprofit organization that aids displaced people from all ethnic groups. If you are unable to donate but you still want to help, tell people about what’s happening and help spread awareness as ignorance is what has allowed this conflict to continue for so long. Rob Payne is a Program and Research Intern with the SISGI Group focused on emerging democracies in the Middle East, suppression of ethnic minorities in Southeast Asia, and neocolonialism in South America. He is a history and peace studies student at Goucher College. Thanks for the support, I post every Tuesday and Friday, keep an eye out for more, and I encourage you to read the other posts on the blog they are all very insightful.